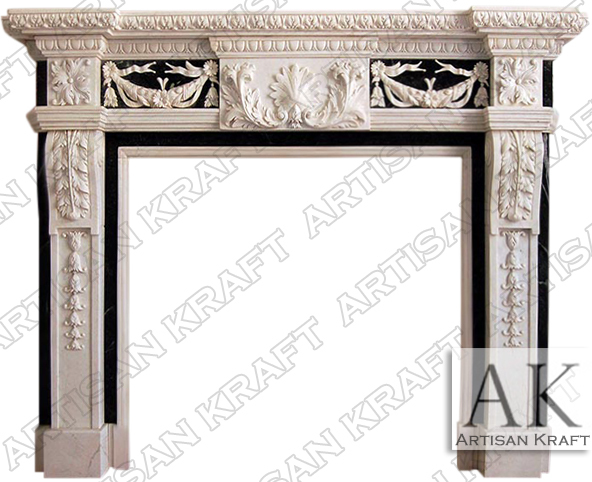 The Delaware marble carved surround is a two-tone mantel. In this image it’s made from a stately black and white. It’s a design that incorporates French and Italian style elements. This regal design with its leaf and floral carving is a great choice for you custom home. A detailed step shelf and frieze complete the look. Learn more in the links below. Useful information like how to clean stone and installation can be found in those links. Typical Dimensions: 72″ wide x 52″ high *can be made to custom dimensions. Stone: Marble, limestone, sandstone. Available in many different colors and finishes.